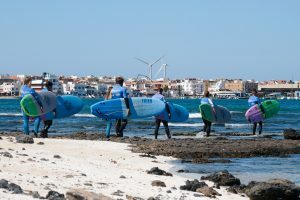 Our surf courses in Fuerteventura we teach groups with max. 8 persons. 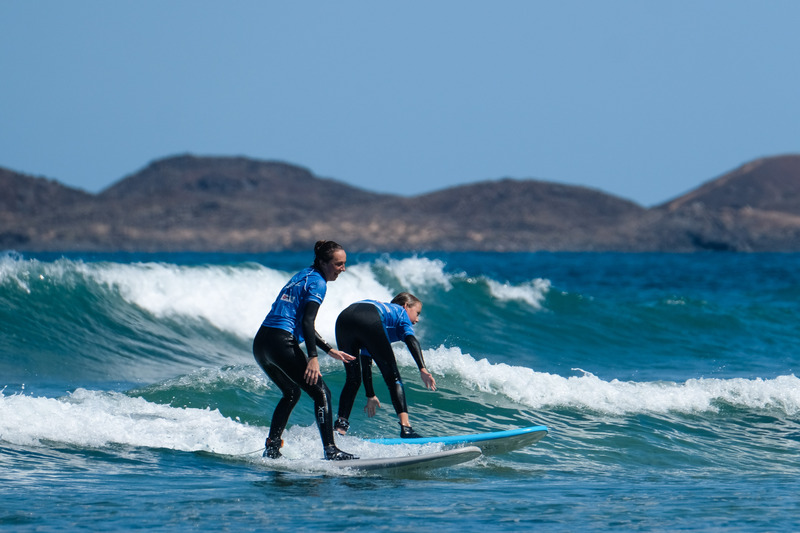 The surf lessons Fuerteventura are given from qualified teachers who improve your surfing – no matter which level. Because of the group size the teacher has always the opportunity to pay attention on your needs. Through this effective coaching your surfing gets improved very fast and you will recognize progress soon. Every day you have two sessions. Between them you can gather your strength and relax on the beach. In total you have four lessons a day. We have made the experience that more lessons hinder the improvement of your surfing because you demand your body too much. In addition to the practical experience you also get theoretical lessons where you learn more about the ocean and the formation of waves. The surf equipment we use for teaching is of high quality and versatile. We have boards in all sizes and shapes: softtops, hardboards, longboards and also magnums, malibus, minimalibus or fishes. Everyone should find the right board for her- or himself that you can improve your skills. Our Xcel-wetsuits keep you warm during the lessons. The surf spots, where we teach, vary. 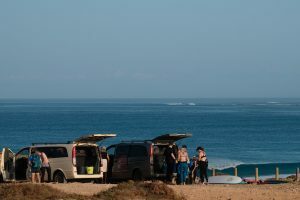 Normally we surf at the beaches in Corralejo, but if there are better conditions for you somewhere else we get there with our surf vans. So we guarantee you the best waves every day. We offer surflessons for surfers every level. In our beginner surf course we want you to stand on your board very fast. We want you to feel comfortable in the water and that you get familiarized with waves. It is also our intention to pass on the fun factor and the joy of surfing. With it the main thing is the practical experience in the beginner course. Of course, you also get theoretical knowledge in these lessons. 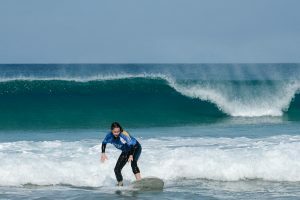 In our intermediate course we teach surfer who are familiar with board and ocean. We want to surf with you the first green waves – unbroken waves and maybe teach you how to do turns. 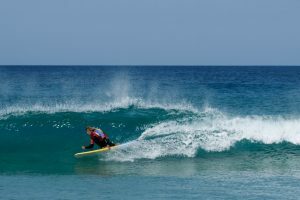 All our surf instructors are very good surfers and they will have many good advices for you to achieve the next level of surfing. 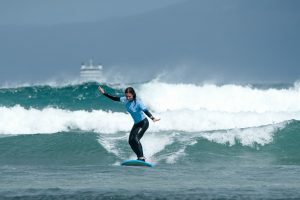 In our advanced course we teach those of you who are able to surf green waves an feel comfortable in waves up to 1,50m. We go surfing with you, try to correct mistakes and through our effective coaching you will learn how to do turns. With that you have the chance to optimize your skills and to get valuable tips from our teachers. For all the people who book accommodation and surf course the equipment is also available on the weekend and outside the lessons. Our deluxe course assures you max 3 persons per teacher. The teaching will be more individual and conformist to your needs. You’ll learn faster and you’ll achieve your aims easier in a smaller group. 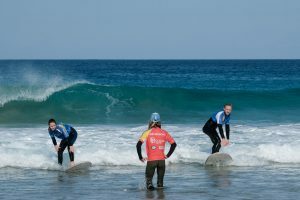 For everyone who wants to try surfing, but isn’t sure yet, if it’s the right thing, we offer our “taster” course. We will teach you everthing that you need to know about the ocean, the waves and your board. 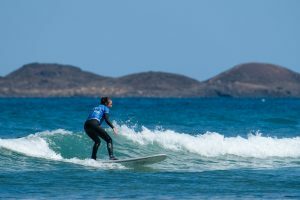 We give you an insight on the surfing lifestyle and if you get hooked on surfing you still can book some other days of course. You want to go travel with your class, student community or with your friends? We got the perfect deal for you! 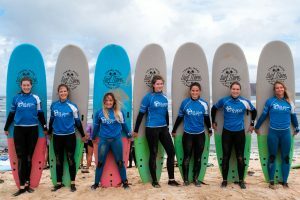 If your planning on doing a group travel, don’t hesitate to write an email to info@planetsurfcamps.com. 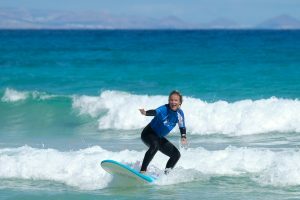 Surfing is a sport for the whole family, that’ why we offer you a family surf course in fuerteventura. Here everyone get’s to experience the surf vibe and can enjoy themselfes. It’s not always possible to go on abventures together, due to a bussy schedule. But in our family surfcamp, we offer you a really special vacation! We teach you how to surf step-by-step and this experience together will your family get even closer. 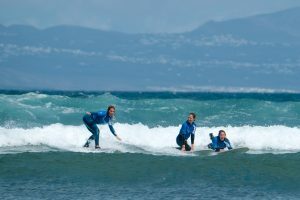 I our family surf courses, we won’t the whole family to have fun, so we like to interact with your kids and you from the beginnig to the end of your stay. 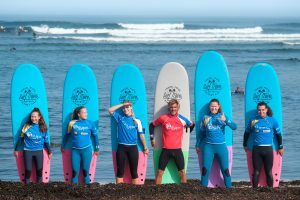 We want you to enjoy an awesome stay in surf camp and to bring back great memories. Depending on your familys surf level we’ll find the perfect fit for you! For more informations, don’t hesitate to contact us! Over the past few years, bodyboarding got to be a target of ridicule, because of hilarious tourists in speedos sliding through the sand. But that’s not, what bodyboarding is really about. It’s water sports just like surfing which offers so many variations and spectacular moves. Surfing crazy barrels or going in the air, there are no boundaries to bodyboarding! Boadyboarding is much easier to learn than surfing, because of easier movements. You’ll process really fast and soon you will be able to go to the water alone. It also is much easier to travel with a bodyboard instead of a surfboard. In our bodyboard classes, you’ll get an effective 10 hour coauching, where we teach you all th important stuff. After you succesfuly surfed green waves with us, we’re going to take you to a reef breack to teach you some tricks. Just one more thing: We teach with proffesional hardslick bottom boards, which aren’t comparable to the common polystyrene boards from all the tourist shops!